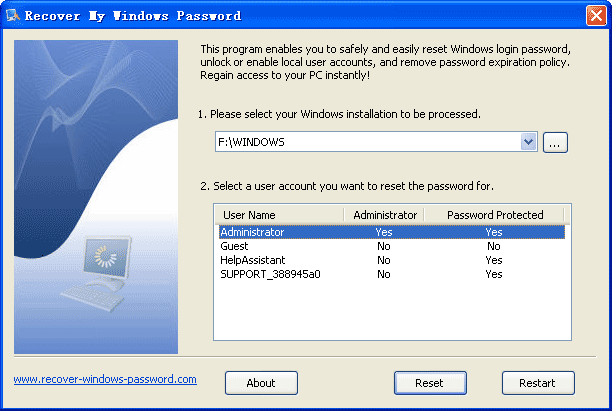 Recover My Windows Password 7.0 is a bootable Windows password recovery software to recover, remove or reset Windows 7, Vista, XP, 2008, 2003, 2000 passwords. It can be used even by beginners to reset Administrator or other account password, unlock / enable Windows user account, disable password expiration option, etc. Instantly regain access to the computer if you can't get into Windows due to a forgotten, compromised or expired password. Help you recover or reset lost Windows password easily! ...... No need to reinstall or format the operating system. * Simple, intuitive graphic interface. * Reset Windows administrator or other local user passwords instantly. * Disable the periodic expiration of Windows passwords. * Change or reset Domain administrator passwords on Windows 2000, 2003 and 2008 Active Directory Server. * Support duel-boot and multi-boot operating system. * Support FAT16, FAT32, NTFS, NTFS5 file systems. * Support RAID/SATA/IDE/ SCSI/SAS hard disk drives. Qweas is providing links to Recover My Windows Password 7.0 as a courtesy, and makes no representations regarding Recover My Windows Password or any other applications or any information related thereto. Any questions, complaints or claims regarding this application Recover My Windows Password 7.0 must be directed to the appropriate software vendor. You may click the publisher link of Recover My Windows Password on the top of this page to get more details about the vendor.